Did Arataka Reigen retain or unlock some psychic powers? At the end of the first season, Mob lent his powers to Arataka Reigen and after that he's able to see Dimple. Before when Mob's brother started to see Dimple, Dimple said this was because he was about to unlock his psychic powers. Did Arataka Reigen retain or unlock some psychic powers after Mob lent his powers to him? As far as I know, not really. 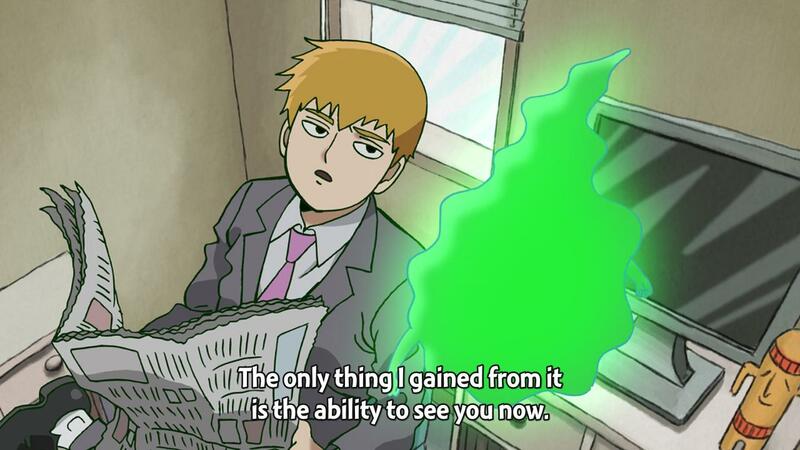 At the end of episode 12 of season 1, Reigen says that the only thing he gained from that experience was the ability to see Dimple now, and that aside from that, not much has changed. Not the answer you're looking for? Browse other questions tagged mob-psycho-100 or ask your own question. How did they do for being able to retain Toichiro Suzuki for incarceration?